Education for Rural People: Conference "Human Development and Food Sovereignty"
The Education for Rural People (ERP) partnership coordinator made a presentation during the Conference on “Human Development and Food Sovereignty" organized by Professor Antonio Bultrini within the framework of the Florence University Inter-Faculty course on "Economic Development, International Cooperation and Conflict Management. A special focus was placed on Strategic Partnerships between North and South, as a key approach to development and ERP was introduced as a successful example of North-South interdisciplinary and multisectoral partnership for development. The meeting was hosted by the Great Hall of the Faculty and about 200 students attended. The event was attended by students of different levels and different branches of the Faculty, including master and PhD students. The conference was co-organised by the Faculty and the Florence University Association for Development Cooperation/Associazione universitaria per la cooperazione allo sviluppo (AUCS). 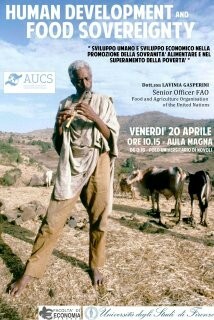 AUCS was founded in 2002 at the University of Florence by a group of undergraduate and postgraduate students in Development Economics. The main purposes of the association include, among others, capacity development though training, self-training and awareness-raising on the issues of development cooperation. The issues addressed and the quality of the speakers helped young people reflect on the themes of development models. Prof. Marliani and Prof. Biggeri introduced to the conference.